Didn't Tiger Woods, right, hear about the NAACP call to "stay out of Target stores" until further notice? The dispute is over the retail giant's ignoring the group's diversity survey. Well the NAACP's Annual Meeting was during the British Open. Or maybe Tiger just didn't get the memo. 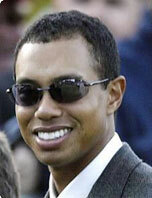 Is Tiger a member of the NAACP? Bruce S. Gordon, left, president of the NAACP does not want to call it a boycott but he has warned Target to respond to the questions about its financial and employment practices, which the company has not done for the past two years. Anyway, it just looks kind of strange that right after the NAACP calls for a "stay out," Tiger advertises to go right on in.